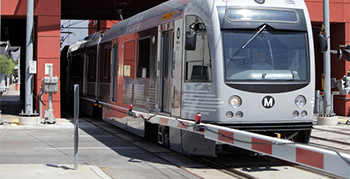 Gold Line (Los Angeles Metro) - Provided rail boot for the light rail line running from Pasadena to East Los Angeles via Downtown Los Angeles serving several attractions, including Little Tokyo, Union Station, the Southwest Museum, Chinatown, and the shops of Old Town Pasadena. Expo Line (Los Angeles Metro) – Provided rail boot for the light-rail line running between Downtown Los Angeles and Culver City, with service to Santa Monica. Kalama Grain Terminal – Provided custom infill to prevent debris lodging between rail and concrete slab during grain unloading process. Anacortes Washington – Provided a specially designed rail boot for use on a new rail spur installed at Puget Sound refinery. We also offer a variety of other elastomeric products used in the railroad industry. We have supplied the rail industry for over 20 years. For more information, please contact our sales team.